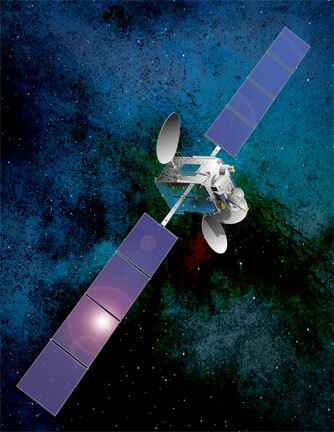 Artistic rendition of the Anik G1 satellite, courtesy of Space Systems/Loral. ...Proton M/Breeze M launch vehicle to push the Anik G1 communications satellites into its orbital slot at 107.3 degrees West. The scheduled launch date is April 16, 2013, at 00:36:00 (local time) from the Baikonur Cosmodrome. 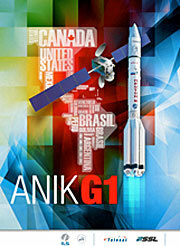 Anik G1 is a commercial communications satellite built by SSL for Telesat. The multi-mission, 55 transponder satellite that will double C- and Ku-band capacity over South America from its orbital location. Such will provide additional DTH services in extended Ku-Band and provide military X-band coverage of the Americas and for substantial portions of the Pacific Ocean. The Proton M launch vehicle, manufactured by Khrunichev State Research and Production Space Center in Moscow, will use a 5-burn Breeze M mission design and will lift off from Pad 39. The first three stages of the Proton will use a standard ascent profile to place the orbital unit (Breeze M upper stage and the Anik G1 satellite) into a sub-orbital trajectory. From this point in the mission, the Breeze M will perform planned mission maneuvers to advance the orbital unit first to a circular parking orbit, then to an intermediate orbit, followed by a transfer orbit, and finally to a geostationary transfer orbit. Separation of the Anik G1 satellite is scheduled to occur approximately 9 hours, 13 minutes after liftoff. A webcast stream may be accessed on launch day at http://anikg1.imgondemand.com/.